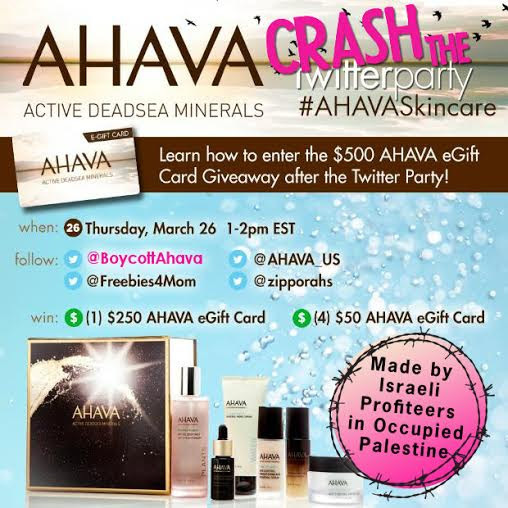 Today, Thursday, March 26 from 1-2 p.m. EST, Ahava US and several of its beauty partners are hosting an #AhavaSkincare “Twitter Party.” We’re going to crash the party with the truth about Ahava and its occupation profiteering. Ahava Dead Sea Laboratories is an Israeli cosmetics company that has been the target of an international boycott campaign since 2009 because of its illegal practices. The company’s primary manufacturing facility and visitors center are located in an illegal Israeli settlement in the occupied West Bank. It pillages mud from occupied shores for use in its products. You can read more about Ahava and the ongoing boycott campaign here. There’s still time to sign up your Twitter account for our Occupation isn’t Pretty Thunderclap which will automatically post our message via your feed at 1:30 p.m. EST during their Twitter party. Our online action team will also be crashing the party between1-2 p.m. EST using the hashtags #AhavaSkincare (that’s their hashtag) and #BDS (that’s ours, and it stands for Boycott, Divestment and Sanctions for Palestinian rights). FEEL FREE TO COMPOSE YOUR OWN, but remember to include #AhavaSkincare and #BDS. Also try to space your tweets out at least 5 minutes apart so they have a bigger impact. GAME ON at 1 pm EST! We hope you’ll help us crash Ahava’s Twitter party today between 1-2 p.m. EST! And thanks for being part of the team working to take the profit out of occupation.